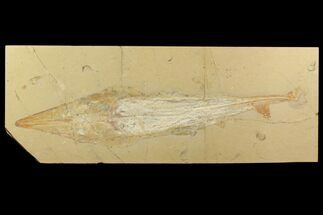 This is a very special specimen from the Upper Cretaceous marine deposits in Lebanon. It is a complete, 1m (36") long, fossil Sand Tiger Shark (Odontaspis aculeatus) including both the positive and negative split. While shark teeth are very common in the fossil record, finding a complete shark like this is EXTREMELY RARE. 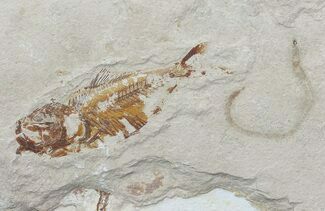 Their skeletons are composed of cartilage that doesn't fossilize well and a larger animal like this would typically have been torn apart by scavengers prior to fossilization. 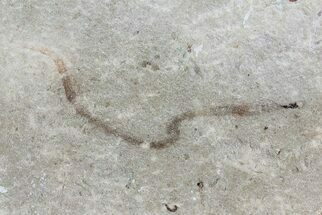 The soft-bodied preservation of this specimen is amazing, and while the head is decayed, a few small teeth are present, floating in the surrounding rock. 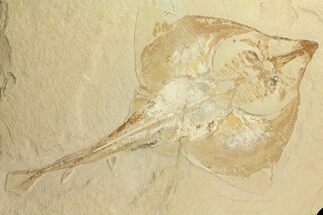 There is also a partial guitar ray (Rhinobatos) present on the edge of the rock. 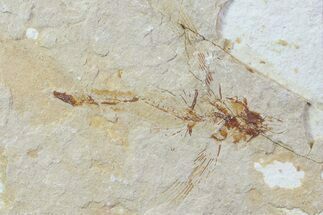 Both the positive and negative split of the fossil are included. There has not been any restoration done other than repairing and filling cracks in the rock. The rock has been backed to provide stability and we can install mounting hardware so that the specimen can be hung on a wall upon request. This a photo of the specimen prior to preparation. The specimen prior to any preparation or repair work. Due to the size and weight of the piece it will need to be shipped in a crate via freight. Freight shipping within the United States is included in the purchase price. International freight shipping will be extra and will be billed after purchase. Please contact us if you need an International shipping quote. 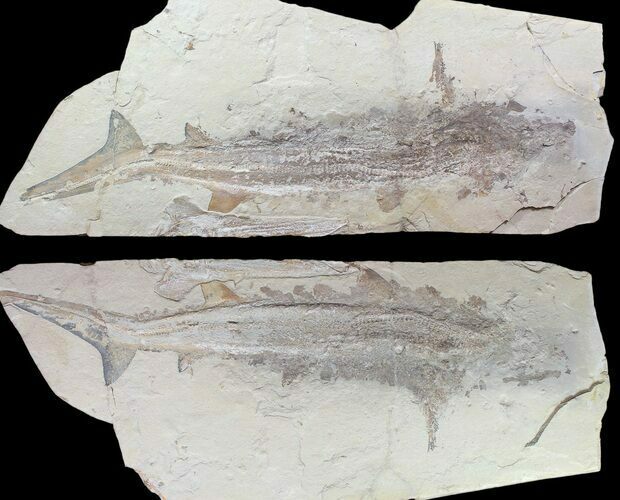 The Upper Cretaceous Lebanese lagerstätten yields some of the most exquisitely preserved fossil fish in the world. Over 80 genera are currently described, with many more still awaiting description. These beautiful fossils have been quarried near Byblos, Lebanon for well over a century and include sharks, rays, shrimp, ray-finned fishes and more.